Treetopia's 6-foot No. 2 Pencil Christmas Tree makes even the smallest spaces in your home look beautiful and festive. 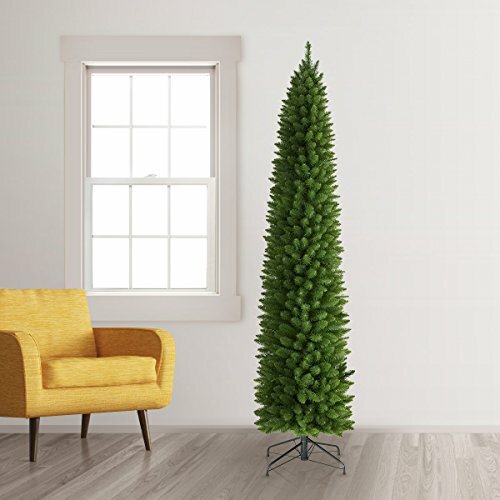 With forest green PVC foliage and a sleek, slender profile, this tree is easy to set up and a joy to decorate. Sturdy yet flexible, these PVC needles give Christmas trees a fuller look while providing ample support for large or heavy ornaments. Treetopia's collection of Christmas décor helps you celebrate the holidays in sensational style. Our colorful Christmas trees and classic artificial Christmas trees are expertly crafted with a keen eye on quality, providing customers with endless decorating possibilities. We also offer a selection of ornaments, accents, and accessories for creating the stylish holiday statement you want in your home. Pencil shape, measuring 6 feet in height (including stand) and 18 inches in diameter. If you have any questions about this product by Treetopia, contact us by completing and submitting the form below. If you are looking for a specif part number, please include it with your message.